I was going through some old photographs from when I lived up in the California Sierra Nevada near Yosemite National Park. I had taken a photo of a very large rock that was sitting upon other rocks, but it didn’t look at all like them. I started to research this and learned a great deal about the phenomena of “errratics”. When the glaciers receded after the last ice age, huge boulders were left in places that were sometimes very precarious. These boulders, which do not match the local bedrock where they are now found, are referred to as “erratics”. Some of these erratics are small, but some of them are huge, weighing thousands of tons and can be five hundred miles or more from their original location. In order to have been transported over great distances, the erratic consists of rock that is resistant to the grinding effect of the glacier and did not shatter with movement. This phenomenon occurred all over the earth, including Scotland. The ice retreated from Scotland in 11,000 BCE leaving quite a few erratic stones located around the country. The greatest concentration of them is located in Ayrshire (Siorrachd Inbhir Àir, “the county at the mouth of the River Ayr”), the area in the southwestern part of the country along the Firth of Clyde. This new knowledge set off a whole different course of research, and now the route for the trip to Scotland later this year has been altered slightly to accommodate seeing a few of these stones. There is a certain type of erratic stone that is so precariously placed that it actually rocks when touched. Rocking stones (also called logans or roggans) are also known in Scotland as clach-bràth (“knowledge stone”). This reference comes from the Druidic practice of using the stones as a form of judgment. A person’s guilt or innocence could be determined by the way the stone moved when the person sat on it. Unfortunately, there are some that no longer rock because they were damaged when human curiosity outweighed common sense and people dug around the base of, or in some cases actually moved, the stones. The Cuff Hill rocking stone, near Hessilhead in Beith, North Ayrshire, no longer rocks because people dug around the base of it to try to find its balance point. It has some association with the Druids and it, along with a small grove of standing stones called “Druids’ Graves”, was found in 1813 enclosed in a drystone dyke. A cleft in the side of Cuff Hill that is known as “St. Inan’s Chair” from the legend that he used it as a pulpit is still visible, although the sacred well that stood by it was covered over in 2006. The stone itself measures 6’9” x 6’6” x 4’ and is estimated to weigh seven tons. I found some hiking notes regarding this site which were written in 2013, and it seems that it is extremely difficult to access the area directly around the stone and the grove. The Clochoderick stone, located near Howwood (Coille an Dail) in Renfrewshire (Siorrachd Rinn Friù), is another stone known as a Druidic judgment stone. Unfortunately, this stone is also one that no longer rocks. It measures 12’ x’17’ x 22’ and sits in the middle of a field. Legend also states that is marks the place where Rhydderch Hael, the King of Strathclyde was crowned King by Merlin, or that it is where he was buried. The Thurgartston, also called the Ogrestane, stone is located near Dunlop. It has an estimated weight of twenty-five tons with the above-ground rock measuring 12’ x 8’. Ogrestane may refer to some ancient myth thereby becoming “The Ogre’s Stone”. The alternate name of this stone may come either from the Old Norse for “Thor’s Great Stone” or possibly “Thou Great Stone” (“grit stane” in Scots). It could also possibly be derived from the Scottish word “Tagairtstane” meaning “the Priest’s stone” which would probably allude back to the Druidic and pagan rituals. May Day celebrations continue at this site in modern times. It is thought to have been a rocking stone, but the earth has come higher around it, and it no longer moves. Further away from our originally-plotted course, but still within possibility, lie three mores stones. 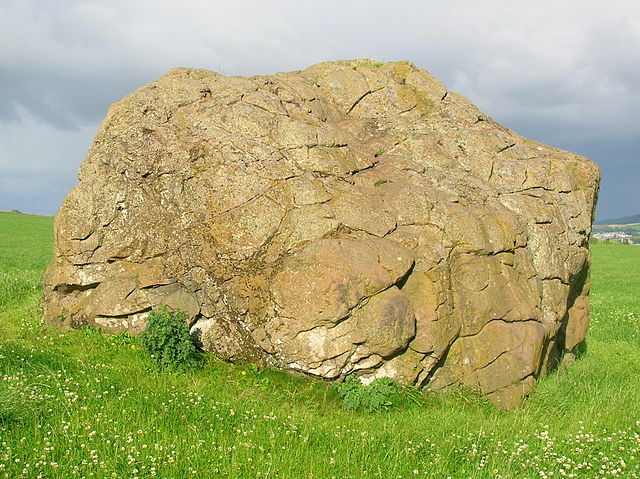 The Logan Stone, located in the North Carrick area of South Ayrshire, measures 4’3” x 4’ x 3’ high and can still be moved to rock. The Lamargie stone, in the Parish of Auchinleck, Ayrshire, is also considered a Druid stone. Formed of two vertical stones and a horizontal one, it stands six feet long and four feet high in a hollow where two streams meet. 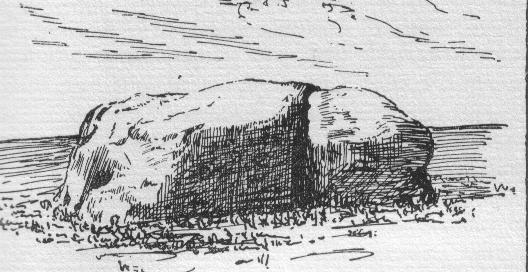 On the Craigs of Kyle near Colton in Ayrshire stands the Boarstone, also called the Witches’ Stone. It stands on three other stones, and is estimated to weigh around 30 tons. This stone is located near the site of St. Bride’s Chapel, continuing the pattern of Christian sites being placed either on or very near sites that were sacred to the pre-Christian peoples of the area. All of these sites are out across fields, so visiting them will certainly be dependent upon the weather. We may have to limit ourselves to just one of them due to time constraints, in which case the choice will be made in the moment. This entry was posted in Ancestry, Eco-travel, Ecology, Land trust, Scotland, Scottish ancestry, Travel, Uncategorized and tagged "Erratic" stones, Ayrshire, Rocking Stones, self-drive Scottish tour. Bookmark the permalink.